According to the Adventist fundamental belief number eighteen, the written works of Ellen G. White "are a continuing and authoritative source of truth which provide for the church comfort, guidance, instruction, and correction". In practice her words are considered at least equal to that of Scripture for a Seventh-day Adventist. The overall purpose of this commentary is to show that to live by faith the only reliable source for understanding to do so is the Holy Bible. In order to consider to consider what Scripture means by 'there is salvation in no one else' we need to go back in time and consider what God means when he said mankind was created "in our image", Gen. 1:26. Keep in mind that God is spirit and can only be worshiped in the spirit, John 4:24. Therefore it is clear, unlike the creatures we were to have dominion over, we were created with a living spirit patterned after the likeness of God. Next, we need to consider what it means when God said anyone who ate of 'the tree of the knowledge of good and evil', Gen. 2:15-17, would die on the day they ate of it. Since they did eat they did die on that very day, yet they didn't experience physical death until many years later. What died was their spirits. The Adventist concept of our spirit being simply some kind of atmospheric air God breathed into Adam is nonsense. Why? Because the day they sinned Adam and Eve's spirits died yet they didn't stop breathing air and they didn't die physically until many years later. Notice carefully that this passage lists the death, burial and resurrection as the foundation of a Christian's salvation. For your faith to be real there is no work of your own you can add to this Scripture passage. Real faith is founded upon nothing other than the complete finished work of Jesus Christ as recorded in the Holy Bible. When all your sins (past, present & future) have been covered by the blood of Jesus shed at Calvary your dead spirit has been born again and you can know you are eternally secure in the kingdom of God, Romans 8:31-39, never to be separated from the love of God. If you add anything of your own works to the finished work of Jesus then what you have is not faith founded upon eternal truth. Your faith is futile. If you add anything to Scripture and call it the inspired revelation of God then your faith has been placed upon an insecure foundation. The assertion being made in today's lesson is that wisdom means to obey the eternal laws of God. It is certainly true that to not obey God is sin. The real issue isn't about whether or not we should obey God. What is of concern is that within Adventist theology it is asserted that there are certain moral laws of the covenant God made with Israel at Sinai which are still binding upon Christians since they are assumed to be the recognized 'eternal laws of God'. The Mosaic Laws are the conditions that must be obeyed only by those who are covered by the Sinaitic Covenant. To be entitled entry into this covenant first the Jewish men had to be physically circumcised. However circumcision, the sign of the covenant God made with Abraham, was first given to Abraham 430 years before the existence of the Sinaitic Covenant and the laws contained in this covenant. The Prophet Jeremiah told of a time when there would be a New Covenant with the laws of God written on the hearts of those who would be covered by this covenant, Jer. 31:31-34. Laws of a covenant that has been replaced cannot be called 'the eternal laws' of God. The Sinaitic Covenant had both a starting point and an ending point in time. Therefore the requirements (the laws) of this covenant cannot be considered eternally existing from the time of creation, Gal. 3:15-18; Rom. 7:1-6. All sinners utterly fail to keep the Mosaic Laws perfectly, Rom 3:23; Isa. 64:6. Jesus teaches us that the real 'eternal laws of God' are infinitely more impossible for a sinner to perfectly obey than the 'minimal standards' of the Sinaitic Covenant, 1 John 3:15; Matt. 5:28. When Jesus announced a New Covenant his commands replaced the written conditions (laws) of the Old Covenant, 1 Cor. 11:23-26. Jesus' teaches us that his commands go far beyond the written law of the Old Covenant by his teaching of the Parable of the Good Samaritan, Luke 10:25-37. The purpose of the Mosaic Law is to show what sin is, Gal. 3:19; Rom. 7:7. The only possible way a sinner can experience true victory over sin is to submit to the lordship of Jesus Christ where you submit yourself to his ongoing growing sanctification, Rom. 7:19-25. The Sinaitic Covenant had both a beginning and an end. Therefore the law contained within this covenant cannot be the so called the 'eternal law of God'. Only the Jews were party to the Sinaitic Covenant yet all sinners (including Gentiles who were not included in this covenant) die because of sin. The death of Jesus at Calvary fulfilled, thereby ending, the Sinaitic Covenant including the laws contained within this covenant, Rom. 7:1-6. Only as you accept the salvation message of the gospel message of Jesus Christ, as outlined in yesterday's commentary, can you submit to the Savior and Lord Jesus Christ whereby through his ongoing sanctification experience victory over sin. The lesson refers to Romans 7:7-13 and Galatians 3:24 and even stresses 'reading in context'. 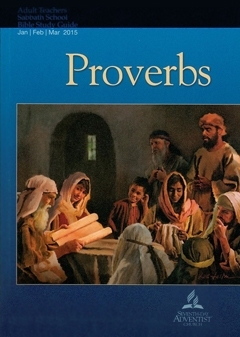 Then, with reference to Proverbs 28:5 asks; What is the key for us to “understand all”? Jesus Christ clearly said that one of the important roles of the Holy Spirit is that of leading a person into all truth, to those he gives the gift of the Holy Spirit, John 15:26 & 16:1-15. Due to faulty theology as already outlined this week, Adventist do not recognize the role of Jesus' gift of the Holy Spirit in bringing your sin-deaden human spirit life thereby inducting you into the kingdom of God. Unless you have been born-again of the Holy Spirit you cannot know or understand the deep meaning of God's word. Without having accepted by faith, without any works of your own, the reality of the biblical gospel message in your life you have not been born-again of Jesus' gift of the Holy Spirit and therefore lack the ability to understand the wisdom of God that can only come from the indwelling regenerating Holy Spirit in your life. While the lesson make excellent points concerning the rich and powerful, 1 John 15-17 is not directed exclusively towards them. We must remember that when the Apostle John says "do not love the world" he is addressing all Christians whether they be rich and powerful or they be of any other status in life. What the 1 John 2:15-17 passage is really teaching is to have 'the love of the Father' within you so as to not lust after the 'things of the world'. Since John is addressing Christians it is certain he is speaking to those who have experienced the benefits of the gospel message of Jesus Christ's death at Calvary. The desires of the flesh is not an exclusive issue concerning the rich and powerful. We all sin and desire the things of the world whether we achieve them or not. The desire is the root of our sin. The only way to not submit to 'the desires of this world is to submit to the Lord Jesus Christ and know you are dead to the Old Covenant Law (Rom. 7:1-6) as you walk according to the Law of the Spirit as outlined in Rom. 7:21-8:8. In addressing the condition of the poor it is recognized that because we all come progeny of Adam and Eve we have all been created equal. However, according to the standards of this world's system contaminated by sin not all are rich and powerful. Many suffer because of the evil that exists in this present world. These returning evangelist were rejoicing in the power they had experienced over 'even the demons'. Jesus response was to caution them to rejoice instead in knowing that their names were written in heaven. All the power in the world cannot equal 'God given power' yet even this is surpassed by the joy of knowing your name is written in heaven, Rom. 8:31-39. Know that we are all created equal by God, yet as sinners, we are all born dead in our sins. Whether we are rich or powerful or not is not the measure of our value in the sight of God. Even if you are not one of the rich or powerful know that the one thing of greatest personal value is to know your name is written in heaven. As a born-again Christian, regardless of your status in life, you can know right now this moment today, that you will never be separated from the love of God. Notice that, according to this passage, those who love truth will be saved. Therefore it is imperative to know what truth is and where to find truth. “Whatever line of investigation we pursue, with a sincere purpose to arrive at truth, we are brought in touch with the unseen, mighty Intelligence that is working in and through all. The mind of man is brought into communion with the mind of God, the finite with the Infinite. The effect of such communion on body and mind and soul is beyond estimate.”—Ellen G. White, Education, p. 14." In the interest of pursuing the love of truth we will compare the phrase; "body and mind and soul" as used in this Ellen White quote to the biblical concept, covered earlier this week, that mankind was created 'in the image of God'. Earlier this week it was established that mankind was originally created with a living body, spirit and soul patterned after the image of God. Orthodox Christian doctrine, as expressed in the following New Testament verses, define the meaning of having been created in the 'image of God' to mean that mankind was originally created with a living body, spirit and soul patterned after God's own image. Furthermore, when Adam and Eve sinned, on the very day they did so, it is their human spirit that died. The gospel message of Jesus Christ's death at Calvary was not just the 'payment' of the debt of sins 'for all for all the world'. When you accept Jesus gift of eternal salvation Jesus does much more, including bringing your dead spirit to life through his gift of the Holy Spirit thereby ushering you eternally into the kingdom of God. Therefore Ellen White's use of the expression "body and mind and soul" is founded upon the false doctrine and belief concerning our dead human spirit we are born with. If a person of integrity really does love truth then the writings of Ellen G. White must be rejected as the source for understanding Scripture. “The laws of God have their foundation in the most immutable rectitude, and are so framed that they will promote the happiness of those who keep them. . . . Religion brings man into personal relation with God, but not exclusively; for the principles of heaven are to be lived out, that they may help and bless humanity.”—Ellen G. White, Sons and Daughters of God, p. 267." Broadly speaking it is understood that religion has to do with how a person relates to God or how to please God. In practice, this normally involves adopting a sets of beliefs about who God is and what one must do to please God. According to James' epistle religion that is pure and undefiled before God is something a person does. The real question should be; can a sinner come into a personal relationship with God through one's own will power, deeds or any kind of self effort? Salvation, to join the kingdom of God and come into a personal relationship with God, is impossible for sinners to accomplish by any kind of self-works because all sinners fall short of the glory of God, Rom. 3:23. To join the kingdom of God, and therefore come into a personal relationship with God, you must first be born again of your spirit which is something impossible for a sinner to do. Salvation is totally and only a work of Jesus Christ through his shed blood at Calvary. Religion that is 'pure and undefiled before God' is the result of having a personal relationship with God, not what causes this relationship. Therefore, since our personal relationship with God is totally and only a work of our Savior Jesus Christ, Ellen G. White is wrong in saying; " Religion brings man into personal relation with God". Copyright 2015 BibleStudiesForAdventists.com. All rights reserved. Revised March 13, 2015. This website is published by Life Assurance Ministries, Camp Verde, Arizona, USA, the publisher of Proclamation! Magazine. Contact email: BibleStudiesForAdventists@gmail.com.